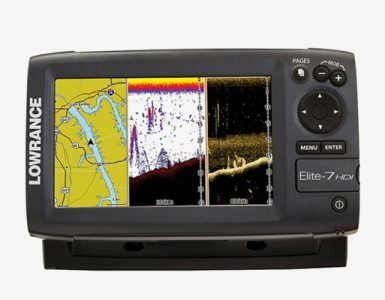 While there are many options out there when it comes to fish finders, the Lowrance Elite 5 Chirp is doing its best to stand out from the rest of the crowd. As a result, the manufacturer has combined only the best of sonar technology with DownScan imaging and GPS mapping. The CHIRP sonar technology allows this unit to be equipped with the tools needed to make it really sensitive to searching for fish while offering an enhanced noise rejection and target resolution. As a result, it has become a whole lot easier to see game fish and baitfish targets. The new Lowrance Elite 5 Chirp ice machine uses a high resolution 5-inch colored screen, allowing a clear view of what is happening underwater. It also offers better identification of targets at higher depths, as well as marks fish clearly even at faster boat speeds. This proves to be a major advantage of this unit. It also makes good use of multiple sonar settings which may easily be viewed on a single display, while the DownScan imaging offers detailed images, making sure that you do not have to worry about identifying the fish below. The fishing world was filled with excitement when the CHIRP sonar of the Lowrance Elite 5 model was introduced. This sonar is a combination of standard sonar alongside DownScan imaging technology, as well as CHIRP sonar. The technology behind the use of sonar acts in a way that the Sonar system sends off sound pulses over a particular frequency band for a long period of time, as compared to the shorter pulses used in a single frequency on standard sonar. The benefit that it is supposed to offer is that you can avoid clutter and noise, and results in better target separation as well as clearer overall readings. 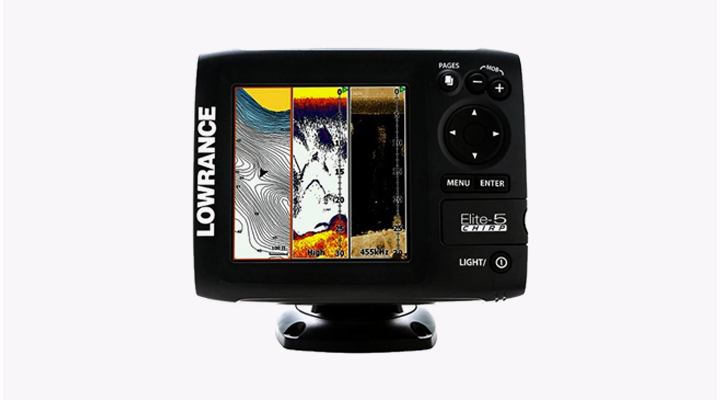 The Lowrance Elite 5 Chirp is best for greater depth performance, as well as in marking fish at various water depths. There are different options when it comes to fish finding equipment. 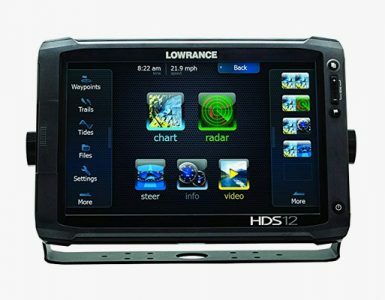 However, the best competition of the Lowrance Elite 5 Chirp is its siblings under the same series, the Lowrance Elite 7 and Lowrance Elite 9. The differences among these three options have something to do with the use. 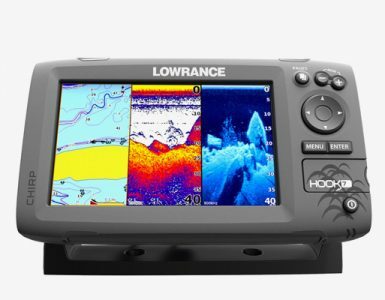 For instance, the Low Chirp, or the Lowrance Elite 5, is highly recommended for maximum depth performance, as well as in marking fish at different water depths. On the other hand, the Elite 7 is considered a medium Chirp. It comes with wider area coverage, allows for faster searching as well as bigger fish arches. However, it has less detail all in all as compared to high chirp. Lastly, the Elite 9, or the high chirp, is recommended for use in freshwater, which is what it was designed for. It comes with the highest tracking detail on lures as presented on the screen. Thus, you can easily expect to see game fish near your bait fish, or when fish are hugging the bottom. While the features of these three siblings are somewhat similar, their purpose of use and capabilities are different. Therefore, it is up to you to decide. This can be done by making sure that you take into consideration your preferences and needs as a fisherman. What makes the Lowrance Elite 5 Chirp powerful enough to stand against the other players in the fish finding industry is its own set of features. For one, it has the powerful Broadband Sounder, which refers to the dual beam sonar in which everyone may be familiar. It is also built into the transducer. It also has a trackback sonar history that enables you to scroll back and browse on your sonar history in order to mark objects and fish on the bottom. This can remove the need to turn around and simply hover over the same spot again and again. This may prove to be very helpful, particularly on smaller screen fish finders. The optional upgradable charts are also equipped with a single microSD card slot which is highly compatible with most leading mapping products including HotMaps, Navionics Gold, Fishing Hotspots, Nautic Insight, as well as Jeppesen C-Map Max-N. In fact, you also have the option of creating personal maps. This can be done with the use of Insight Genesis. This will allow you to take sonar recordings out of the Lowrance Elite Chirp unit, uploading them for free to the insight Genesis platform in order to create a customized map. No doubt that the Elite Chirp models, including the Lowrance Elite 5, have become very popular in terms of fishing equipment. This is for good reason. You definitely have a good option if you are planning to use this tool for different purposes and activities, and depending on your boat. Lowrance, as the manufacturer, has single-handedly pushed all of the advantages of the Chirp sonar technology toward mainstream depth finders. This simply means that you now have the chance to enjoy the best of this clear scanning sonar system.